Published on 4 January 2007. Anyone who says that the French have no sense of humour is wrong. 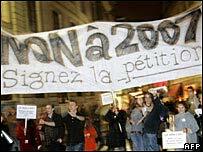 According to the BBC, a protest has been held in Nantes against, erm, the year 2007. The group, parodying the French’s penchant for protest staged one against the New Year, called on the UN to “stop time’s mad race” and declare a moratorium on the future. And the best bit? At midnight, when the protest failed, they started chanting “No to 2008”, and promised to be back next year, bigger and better on the Champs-Elysees. And people say true irony is uniquely English. This 1,029th post was filed under: News and Comment. Comment posted at 08:39 on 4th January 2007. Comment posted at 00:52 on 5th January 2007. Glad you liked it – your ‘Roses are Red’ poem made me smile, too!